The steel plant is owned by U.S. Steel, which has called back about 800 workers since Trump announced last spring he was imposing a 25 percent tariff on steel imports and a 10 percent tariff on aluminum. The plant workers are among the 500 people invited to hear the president. 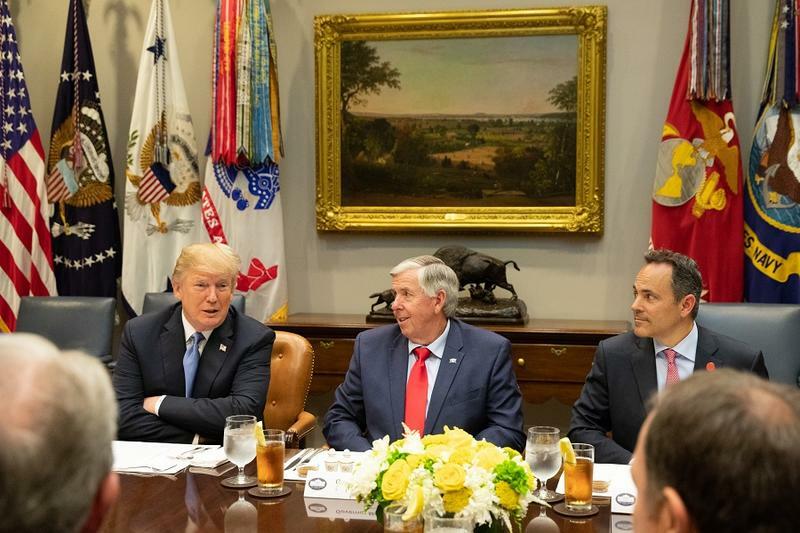 Aides said the president is aware that some other factories – such as the Mid Continent Nail Corporation in Poplar Bluff – have been hurt by the tariffs. Mid Continent is among the nation’s largest producer of nails, and expects to lay off hundreds of workers. President Donald Trump speaks to supporters during a stop last November in St. Charles. Trump believes that the nation’s workforce affected by the tariffs now — even if they lose their jobs — will benefit in the long term, aides said. Farmers in Illinois and Missouri also are being hurt by the drop in trade – particularly involving soybeans and grains – with other countries affected by the tariffs. The president has announced plans to dole out $12 billion in aid to affected farmers. Trump is scheduled to arrive Thursday afternoon at St. Louis Lambert International Airport, where he will be greeted by Missouri Gov. Mike Parson and Lt. Gov. Mike Kehoe, both of whom held different offices the last time Trump stopped in the St. Louis region. U.S. Rep. Mike Bost, a Republican from Murphysboro, Illinois, also will meet the president. Bost’s 12th district includes Granite City – and could be pivotal in determining which party controls the U.S. House next year. Kevin Harris and Marianne Laury hang "Imperialist Fantasy Flag," a piece by artist Wonder Koch, outside the Granite City Art and Design District and the STNDRD gallery. There is a star on the flag for every country in the world. Bost is in a combative contest with Democrat Brendan Kelly, who has been endorsed by the steelworkers union. Trump’s visit will mark the second time this week he has stepped on Missouri soil; he addressed a national VFW conference Tuesday in Kansas City. 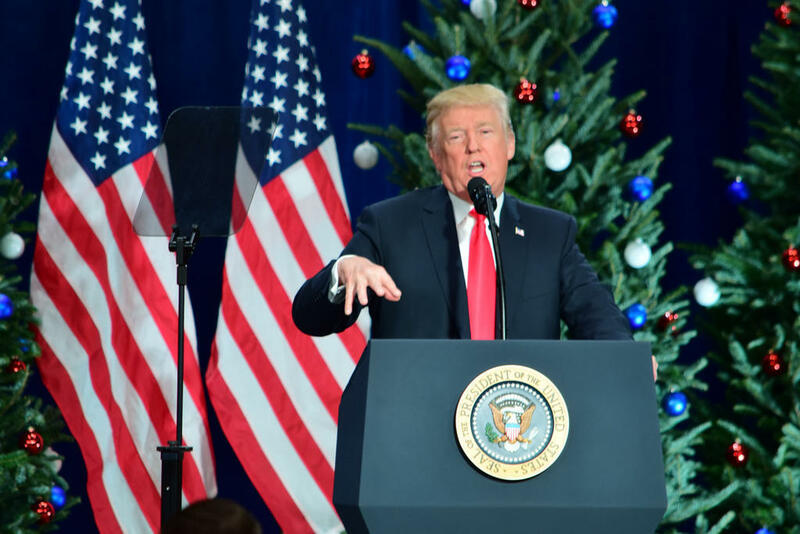 Vice President Mike Pence was in St. Louis last week, and in Kansas City a few days earlier, to promote the tax cuts that Trump signed into law late last year. 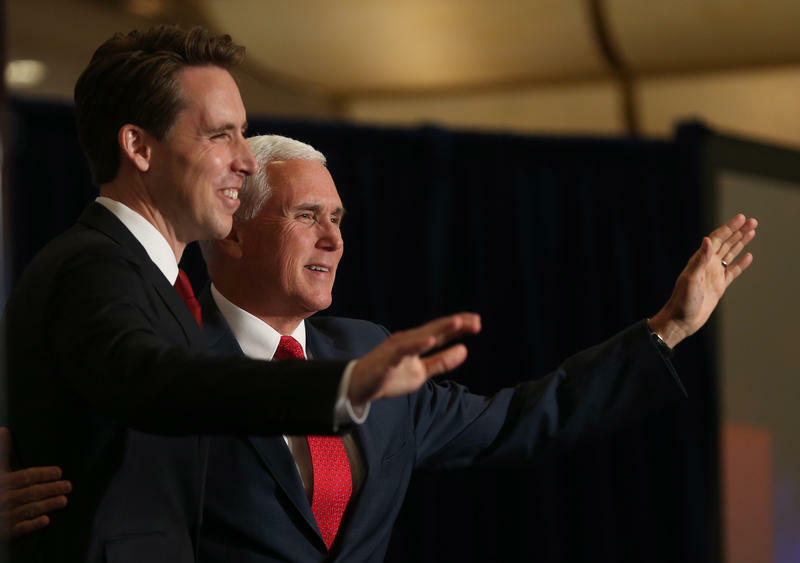 At both stops, Pence also helped raise money for Missouri Attorney General Josh Hawley, a Republican seeking to oust U.S. Sen. Claire McCaskill, a Democrat seeking her third term. A Trump spokesman indicated that the president wasn't doing any political money-raising during Thursday's visit here. Updated July 20 at 4 p.m. — Analysis from St. Louis on the Air added. Updated July 19 at 3 p.m. — U.S. Vice President Mike Pence defended President Donald Trump’s record as “18 months of action, 18 months of results, 18 months of promises kept,’’ as he exhorted St. Louis area supporters to get out to vote in November. In particular, Pence called for help in defeating U.S. Sen. Claire McCaskill, a Missouri Democrat who the vice president contended is too liberal for the state — and the country.